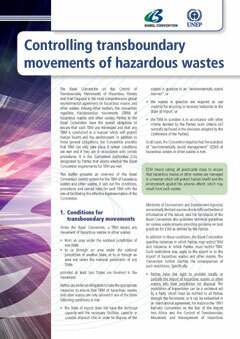 Controlling transboundary movements of hazardous and other wastes is a corner stone of the Basel Convention. Parties to the Basel Convention have the overall obligation to ensure that transboundary movements of hazardous and other wastes are minimized and that any such movement is conducted in a manner which will protect human health and the environment. In addition to these general obligations, the Convention provides that transboundary movements can only take place if certain conditions are met and if they are in accordance with certain procedures. provided at least two States are involved in the movement. the transboundary movement in question is in accordance with other criteria decided by the Parties (such criteria will normally be found in the decisions adopted by the Conference of the Parties). In all cases, the Convention requires that the standard of environmentally sound management of hazardous wastes or other wastes is met. Environmentally sound management means taking all practicable steps to ensure that hazardous wastes or other wastes are managed in a manner which will protect human health and the environment against the adverse effects which may result from such wastes. In addition to these conditions, the Basel Convention specifies instances in which Parties may restrict transboundary movements and instances in which Parties must restrict transboundary movements. Finally, the Basel Convention requires that only persons authorized or allowed to transport or dispose of wastes undertake such operations and that wastes subject to a transboundary movement be packaged, labelled and transported in conformity with generally accepted and recognized international rules and standards. The Basel Convention sets out a detailed Prior Informed Consent (PIC) procedure with strict requirements for transboundary movements of hazardous wastes and other wastes. The procedure forms the heart of the Basel Convention control system and is based on four key stages (1) notification; (2) consent and issuance of movement document; (3) transboundary movement; and (4) confirmation of disposal. The Convention requires all Parties to prevent and punish conduct in contravention to its provision, including illegal traffic. 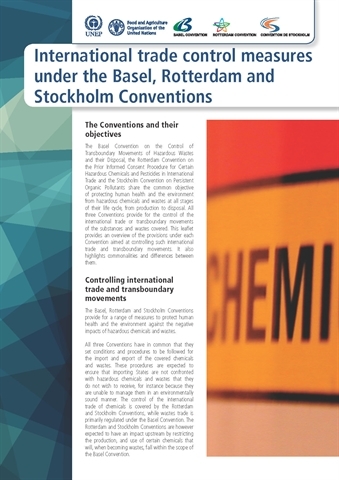 Over the years, the Parties to the Basel Convention have adopted decisions with respect to the Basel Convention provisions aimed at controlling transboundray movements of hazardous and other wastes, developed guidance on the control system and technical guidelines on transboundary movements of e-waste and used electrical and electronic equipment, in particular regarding the distinction between waste and non-waste under the Basel Convention, and adopted notification and movements documents and instructions for completing these. In addition, the Basel Convention Implementation and Compliance Committee has developed an electronic tool to assist Parties and stakeholders in identifying the the requirements applicable to a proposed movement. A leaflet in the six UN languages developed by the Secretariat is also available on the matter.